 This whelpingbox will be updated continuosly with pictures of Enya and the puppie. 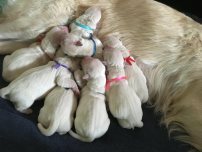 Follow this page and read more about the process and we'll keep updatning about Enya and the future arrival of the puppies. Once again we had to expan puppyland. The puppies have now grown to a certain size, that they don't use the whelpingbox anymore. So the whelpingbox was removed and they now have a lot more space to play on. We have been busy today. The puppies had visit from their soon to be new families. We don't think there's any doubt about how excited they are to get their new member of the family home in about 4 weeks. It's not only us, who's excited about the puppies living in the house. Huxie loves them and he has a lot of joy spending time with them. The play and have fun, he's so gentle and kind. They can attack and bite him and he dosen't care. We don't think there excits a better play uncle than him! Enviromental training of the puppies is something we think is very important, and something we spend a lot of time on through their upbringing. We try to introduce the puppies to a lot of different sound as they grow up. We belive it's very important to make them feel safe no matter what kind of noise they experience. It take som adjustment to hear noises from busses, policecars and firework. We use a special sound CD with contains everyday noises from the enviroment and from the city. We start using this CD on low volume, and as the puppies get used to it, we gradually turn i up. 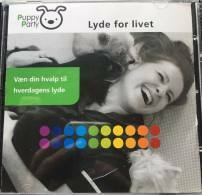 This CD is also given to our puppybuyers, so they can continue the pratice at home. Allready 3 weeks old! 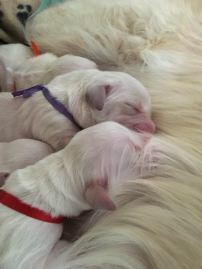 We can't believe that the puppies allready is turing 2 weeks old today. 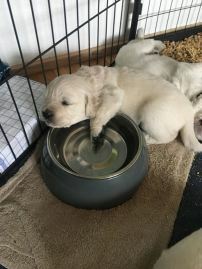 3 weeks is a big step, it means we have to expan the whelpingbox and the puppies now will be introduced to real puppy food - both always seems to be a great succes ! They now reaches an age, where they all try to explore on their own and its so amazing and funny to watch them develop into "small dogs". There's joy and happines in the whelpingbox these days. After the puppies opened their eyes and the fact that they now are able to hear, they're busy exploring the new "world" in front of them. But it takes a lot of energy to explore when its all so new and exciting, therefore the puppies still need a lot of sleep - something they're very good at. Alternative sleeping positions are also somthing new and worth trying, just take a look at the pictures below. 2 weeks old - and now with open eyes! All the puppies have opened their eyes and they look so cute! Today hasn't been a favorite day if you ask the puppies. Today they got their first deworming treatment and the flavour wasn't a succes. They prefer the milk it seems ;-) But luckily mom Enya was ready right after with a comfort drink from the milkbar, suddenly it didn't seem so bad after all - just look at Mr. Green. 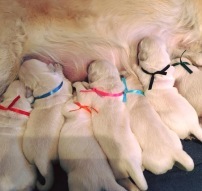 Time flies in the whelpingbox and the puppies are already 1 week old now! 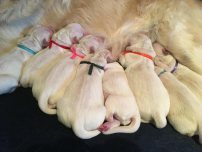 A lot have happend the past week; the birthweight is almost doubled, they now have black pigmentation and the whelpingbox have a few new visitors - new toys, which the puppies love to use when sleeping. The puppies are doing great, they eat and sleep, eat and sleep - life is easy when being a puppy. 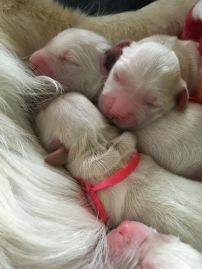 The puppies are born with soft pink noses and feets, but now the pigmentation in their paws and noses has started to appear. We're totallty in love with their tiny black paws, aren't you? Day one i puppy wonderland has been quiet and easy. 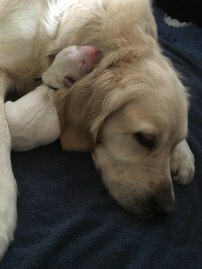 Enya has been resting after the birth yesterday and nursing the puppies like the perfect mom she is. Enya and the puppies are doing great, enjoying the silence and quite space in the whelpingbox. 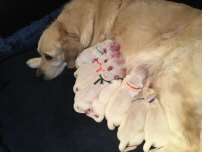 The "milkbar" is open, and the puppies are thriving - some allready gained 50g! 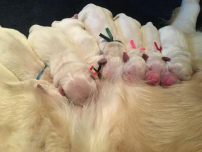 Enya has given birth to 8 lovely puppies - 4 males and 4 females. Both Enya and all the puppies are doing great. 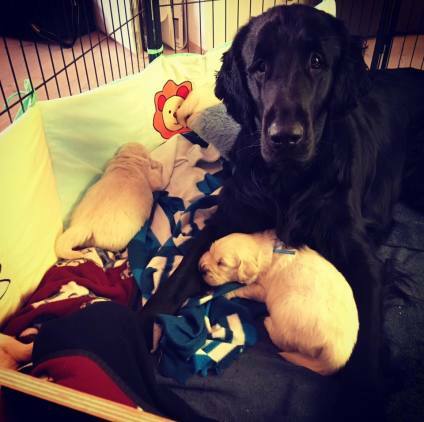 Enya was a supermom while giving birth to the litter. 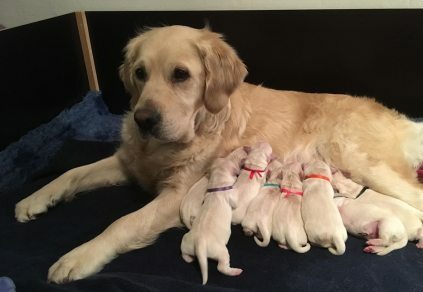 She's such a lovling and caring mom, she truely loves her new babies. 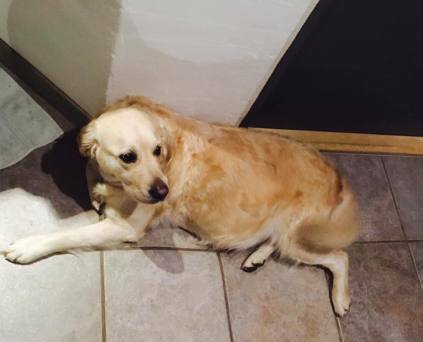 This i how Enya looked last time she was expecting puppies with only 6 days to birth back in 2016. 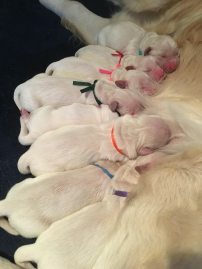 Its important to us and the safty of Enya when giving birth, that we have an idea of the number of puppies. As you can see they're quite packed and there's still a while to the beginning of February and the arrival of the puppies! 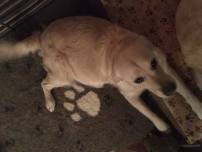 Enya's stomach grows and grows, she's so big now, that a new dog bed was necessary. 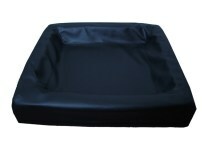 Normally Enya is sleeping in a round bed, but the stomach dosen't fit there anymore without Enya feeling discomfort.  When you see the picture, its clear why. Enya gets weekly weighed and measured so we can follow her progress in the pregnancy, she is getting bigger and bigger now. Now that Enya is confirmed pregnant by ultrasound, it's time to start feeding with Flatazor Puppy. 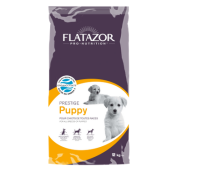 We switch to Flatazor Puppy because of the high contant of energy and nutrition, which is important for the growth and development of the puppies. Read more about Flatazor puppy below, by clicking on the link. 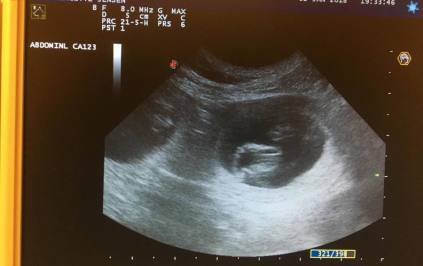 Enya is confirmed pregnant by ultrasound. 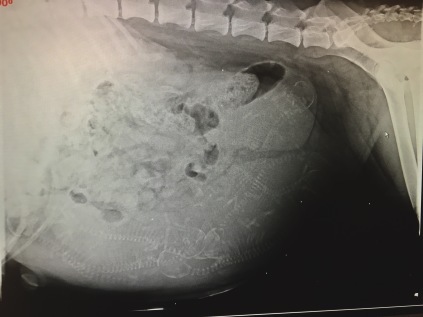 We're expecting puppies in the beginning of February.